Situated 23 miles (37 km) southeast of Glasgow at the confluence of the River Clyde and the Mouse Water, the burgh of Lanark has associations with freedom-fighter William Wallace (1274 - 1305) and the entrepreneur Robert Owen (1771 - 1858). The area may have originated as a Roman station; a parliament was held here in 978 AD under King Kenneth II and the town was made a burgh in 1140 by King David I. Wallace may have lived in Castle Gate before becoming an outlaw after killing the commander of the English garrison there. 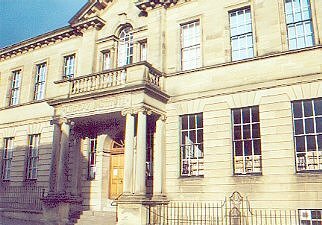 In the 17th Century Lanark was a centre for the Covenanters, with the Declaration of Lanark (1682) confirming the Declaration of Sanquhar. Notable buildings include the 13th century Church of St. Kentigern, where Wallace may have been married, and the Church of St. Nicholas (1774) which includes a statue of Wallace by Robert Forrest (1790 - 1852), sculpted in 1817 and presented to the town in 1882. There is a railway station at Lanark, together with five churches, three primary schools and a secondary school; namely Lanark Grammar School. Local industries include the sale of cattle at Lanark Auction Market, agricultural services, aerospace engineering, steel fabrication and the manufacture of biscuits. Lanark Gala Week takes place annually in June. Born in Lanark were traveller William Lithgow in 1582, obstetrician William Smellie (1697 - 1763), artist Gavin Hamilton (1723-98), actress Margaret Bunn (1799 - 1883), forensic scientist Prof. John Glaister (1856 - 1932), politician Margaret Ewing (1945 - 2006), football manager Walter Smith in 1948, rally driver Colin McRae (1967 - 2007), Canadian country singer Johnny Reid in 1974 and boxer Charlie Flynn in 1993, while born nearby was the hanging judge Lord Braxfield (1722-99). Nearby attractions include New Lanark, Lanark Moor Country Park, the Falls of Clyde, the Newmill Trout and Deer Farm, Cartland Crags and Cartland Bridge.